This woodblock print is a book illustration and appears in the chapter entitled “The Rites and Sacrifices of these Indians, and how these great butchers eat of human flesh.” Like many European authors of the time, Pedro Cieza de León emphasized the practice of ritual cannibalism, and attributed it to the work of the devil in the New World. 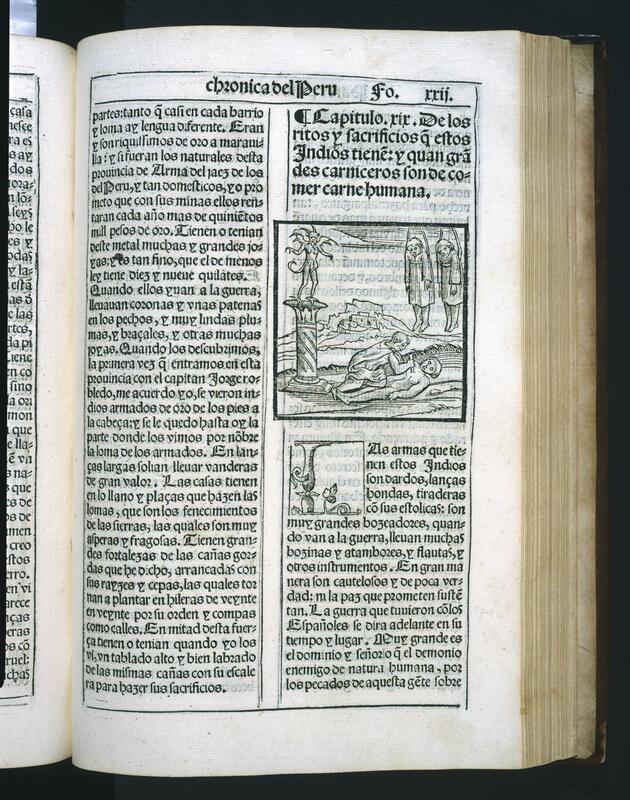 Cieza’s account of Inka history, drawn from first-hand accounts of the Inka themselves, was published in 1553. Cieza’s work is invaluable in its account of pre-Hispanic history and religion. Yet like all Spanish observers, he filtered his information through his own cultural—that is, Christian—framework. Books on the New World were extremely popular among European audiences, and in the mid 16th century, they circulated widely. 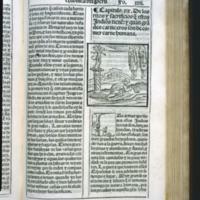 The development of the printing press in Europe in the 15th century meant that hundreds of copies of books could be easily printed and they often incorporated woodcuts like this one. Adorno, Rolena. 1990. “The Depiction of Self and Other in Colonial Peru.” Art Journal 49 (2): 110-118. Cieza de León, Pedro. 1984 . Crónica del Perú, Primera Parte. F. Pease, ed. 2nd edition. Lima, Peru. MacCormack, Sabine. 1991. Religion in the Andes: Vision and Imagination in Early Colonial Peru. Princeton, New Jersey: Princeton University Press.